Many of us feel stressed before a big trip. Questions like “Did we pack everything?” or “Will our flight be delayed?” or “How much time do we need to get to the airport?” fill our mind days or weeks before our vacation. A new study conducted by OnePoll in connection with UpgradedPoints.com found that our worries are warranted. With a pool of 2,000 Americans, they discovered that one in four Americans expect something wrong on every single trip they take, and often, those travel fears come true. The study also found that the average American traveler experiences 240 stressful travel moments in a lifetime. Of the 2,000 people polled, only two claimed they never had a nightmare-travel situation, which makes sense as to why 40% of those polled prepare themselves for worst-case travel scenarios. Some Americans take their travel worries to the extreme. The study also discovered that one in seven Americans believe they are travel cursed, and of those who feel cursed, 73% feel that they are travel cursed for life. Others say that the stress of traveling is the cause of some of their travel woes. Thirty-four percent said that the stress caused them to forget something they needed for their vacation. 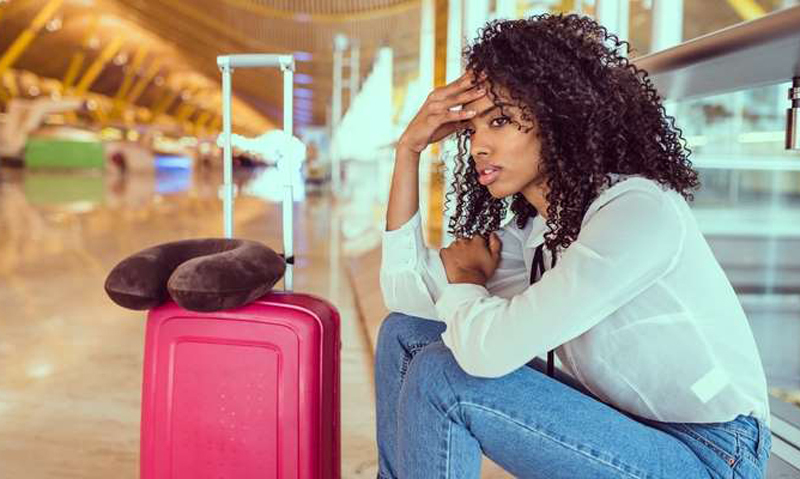 “Travel can certainly be stressful or even chaotic at times — and it seems that many travelers feel they have terrible luck after too many bad, past experiences. Where possible, take every step you can to prepare and plan before your next journey as it’ll help to reduce stress and avoid running into issues when in transit,” said Alex Miller from UpgradedPoints.com in a statement. To combat these stressful situations, one in five Americans said they have canceled their trips and stayed home instead, while 76% said that traveling with someone else helped to ease the experience of traveling altogether. For 55% of travelers, free food and snacks were the ticket to less travel stress, followed by headphones, reading materials, and pillows. “Planning a trip is easier than it appears at first glance. But, facing the reality of actually traveling can be a whole other issue. However, that doesn’t mean people should avoid traveling just because they’ve had a bad experience. Getting out and exploring the world can be fun — travel can be easy, and enjoying it all in the process is doable,” added Alex Miller.